Wilfried Valat makes his home in Roussillon, less than a 30 minute drive from the Spanish border, in the heart of French Catalan country. 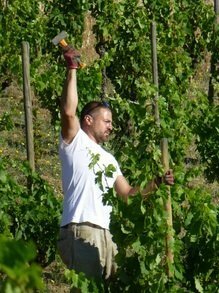 He uses the traditional grapes of the region in his wines: Grenache (Noir, Blanc, and Gris), Carignan, Mourvedre, and Maccabeu. His oldest vines date from the 1960's. Due to the Tramontane wind which blows across Wilfried's vines between 250 and 300 days per year and a particularly hot climate, the yields are low (between 15-20 hectoliters/ hectare, whereas the average in France is between double and triple that amount). Not surprisingly, many of Wilfried's wines are made in extremely low amounts. Wilfried works his land organically and uses only minimal amounts of sulphur at bottling. He has also began making some of his wines with no added sulphur. Wilfried is really beginning to make a name for himself in the organic wine community and this will only continue as more people discover his wines!